Summer vacations call for an outing with the entire family! If you’re one of those with more than 6 people in your family, you’ll need something that can house all of you and still provide the comfort and features of a regular travel trailer. 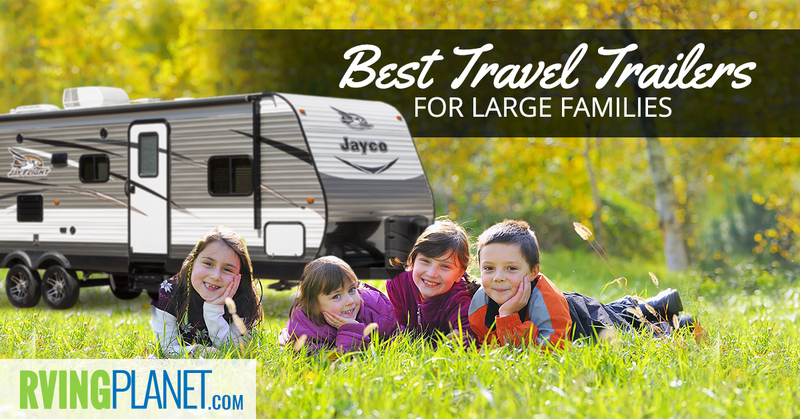 Read on, to discover the top 5 best travel trailers for large families! What puts an RV on the list: It’s not exactly difficult to find travel trailers that have floorplans that can hold 6+ people, but finding good ones that also have noteworthy features and user/critic reviews can narrow the list to a handful of travel trailers. We’ve taken those into consideration and taken a look at the sheer number of floorplans that they have, and we’ve got the top 5! 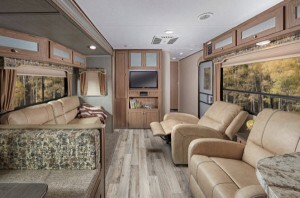 Why we recommend the Coachmen Freedom Express travel trailer: Coachmen’s Freedom Express has lived up to its name, providing you the freedom of 26 unique floorplans that have a variety of sleeping capacities, length, and weight ranges covered. 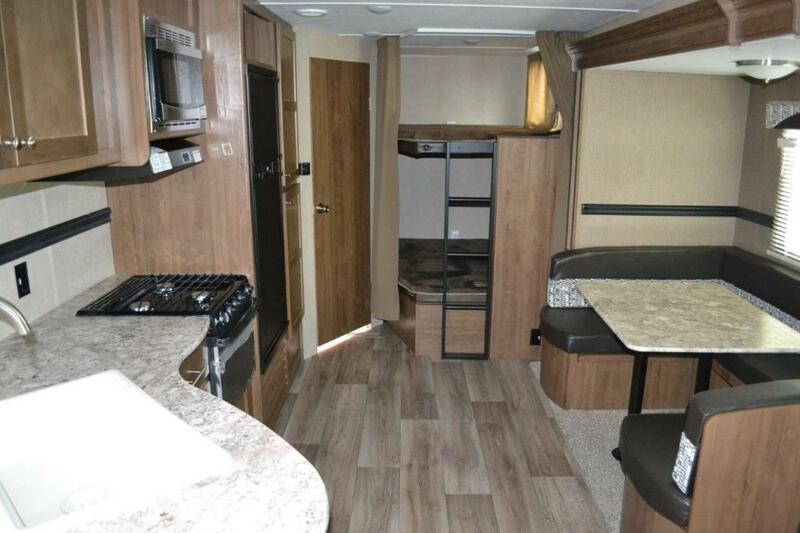 If you’re looking for ones that can handle more than 6 people, 17 floorplans have 6 or higher sleeping capacity. You’ll find that the Freedom Express leaves nothing to be desired. From the interior speakers to the jackknife sofa, it’s all here. Appropriate safety measures are also taken into consideration as the Freedom Express includes a smoke and carbon dioxide detector. Finally, if you want to upgrade this camper in the future, you can do so through various expansions available such as upgrading to a 15,000 BTU AC and frameless windows. 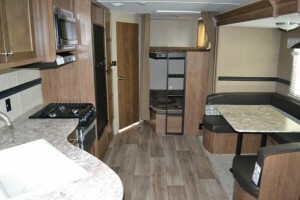 View All Palomino Puma Travel Trailer Floorplans! Why we recommend Palomino Puma travel trailer: The Puma was also featured as one of the best travel trailers for couples on the go, but it’s also got enough floorplans to make it an admirable travel trailer for large families. 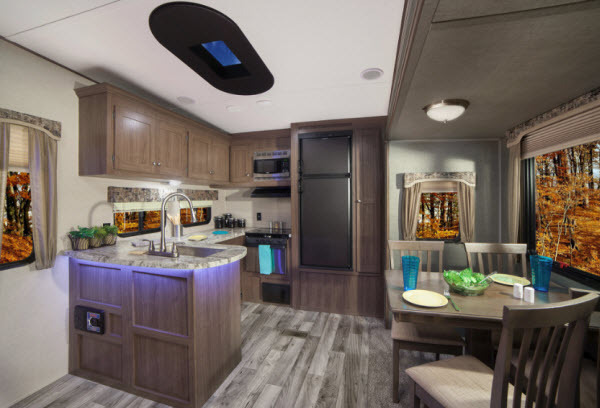 21 floorplans means you have enough options available, and the length range of 38 feet makes it one of the most spacious travel trailers out there. We liked these in particular due to their good ‘length to sleeping capacity’ ratio: Puma 28FQDB and Puma 29QBSS. 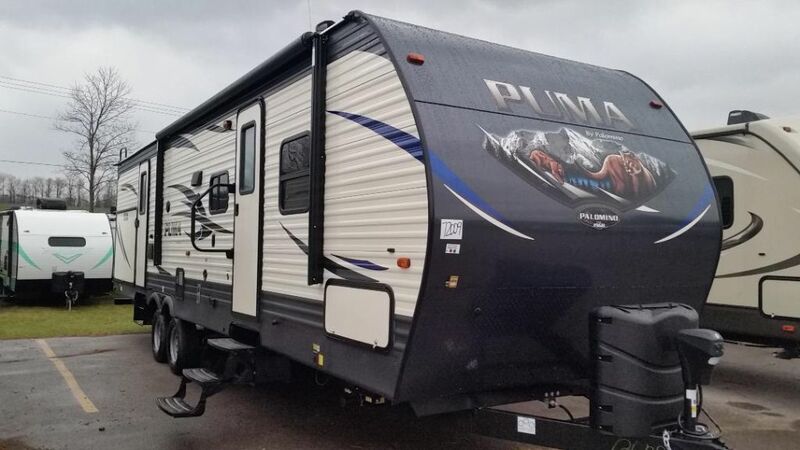 We were really impressed that the Puma has tinted safety glasses, power awning and pass-thru storage, as these are the kind of features which can be extremely useful, especially when traveling with a large family. 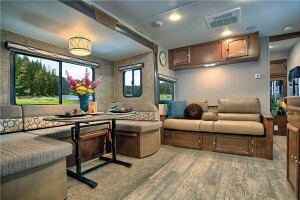 On the inside, it has LED lighting for ambiance, all of the necessary safety measures, and tons of optional upgrades to make this camper even better down the line. 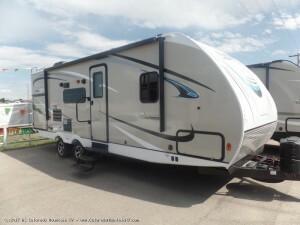 All in all, top marks to Puma for making such a versatile and well-rounded travel trailer! 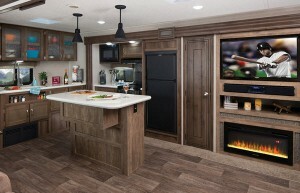 36 Ways To Show A Quality Travel Trailer! View All Dutchmen Aspen Trail Travel Trailer Floorplans! 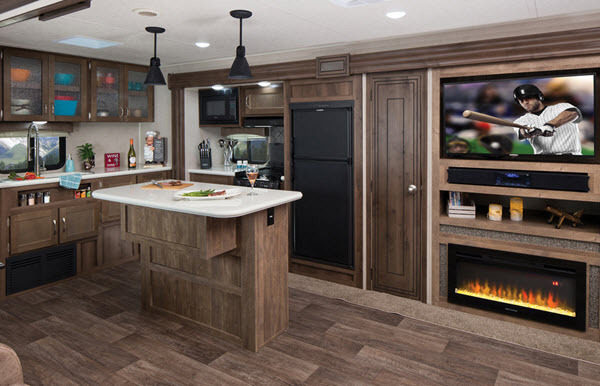 Why we recommend the Dutchmen Aspen Trail travel trailer: The Aspen Trail is one of the finer trailers of the Dutchmen, and has made more than a few appearances on our top 5 lists. It’s on-paper specs are quite impressive, to say the least. 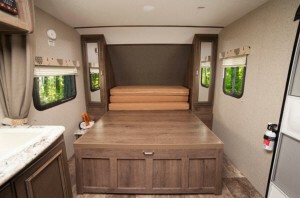 After all, it’s hard to find a camper that weighs as low as 3,125 pounds to 8,126 pounds, which offers more durability, length, and sleeping capacity at the cost of the added weight. Check out these in particular: Aspen Trail 2340BHS and Aspen Trail 31BH. The Aspen Trail is just as impressive when it comes to its feature set. You’ll find the basics: a microwave and a 13,500 BTU air conditioner, along with some extras such as 2 exterior speakers, fully walkable roof, and a stereo system with aux, CD and DVD support! Upgrading the Aspen Trail is easy to do, and the amount of options you get is phenomenal. 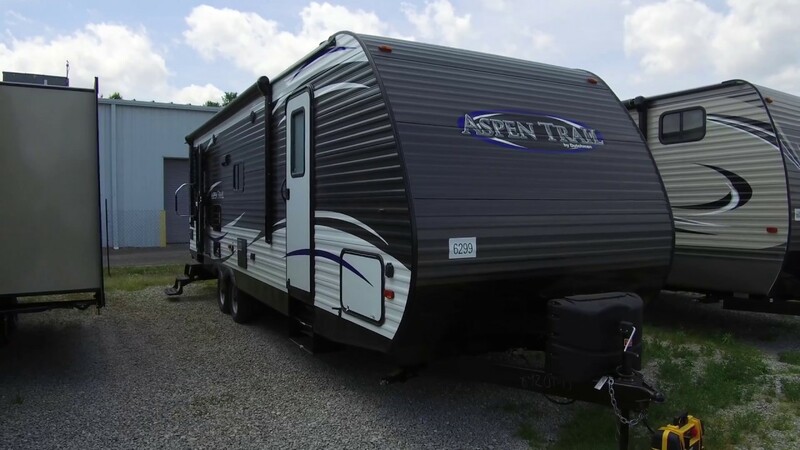 It’s no surprise that the Aspen Trail is considered as one of the best travel trailers of Dutchmen, a company that already makes quality RVs! Why we recommend the Keystone Hideout travel trailer: If the sheer number of floorplans of the Keystone Hideout isn’t enough to impress you, the fact that 33 of those floorplans can actually hold 6 or more people should. It also covers a variety of weight ranges, sleeping capacities and lengths. We liked the Hideout 272 LHS and Hideout 28BHS, but be sure to check out all of them and decide which one suits you and your family best! 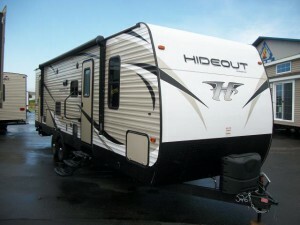 The Hideout also has lots of features to boast of, ranging from a TV antenna with booster to a fully walkable roof. 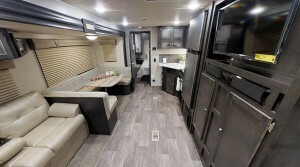 Furthermore, it can be upgraded/modified with a lot of upgrades and expansions, some of which include but are not limited to LCD TV, freestanding dinette and a tri-fold sleeper sofa. All in all, the Hideout leaves nothing to complain about, and you should give it a try if you’re looking for a quality travel trailer! A Floorplan For Every Taste! Learn Keystone Passport Travel Trailer Floorplans! 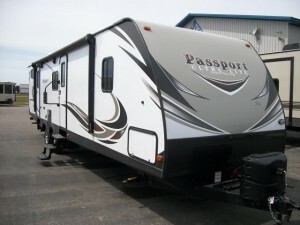 Why we recommend Keystone Passport travel trailer: Keystone has made another great RV with it’s Passport travel trailer. 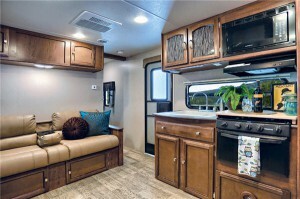 You’ll find the Passport to feature a variety of 31 floorplans, 16 of which have 6 or more sleeping capacities. Check out the Passport 3350BHWE Grand Touring and the Passport 3350BH Grand Touring if you’re interested in a recreational vehicle that can have the sleep to length ratio. 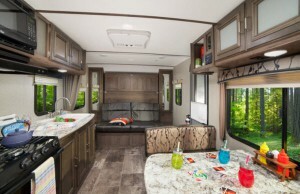 Another aspect of the Passport that we really liked were the tons of storage compartments and spaces all over the RV, making it awesome for large families to store all of their stuff and not run out of space. 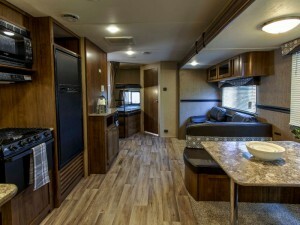 Apart from that, it has all of the amenities in a regular travel trailer and then some. 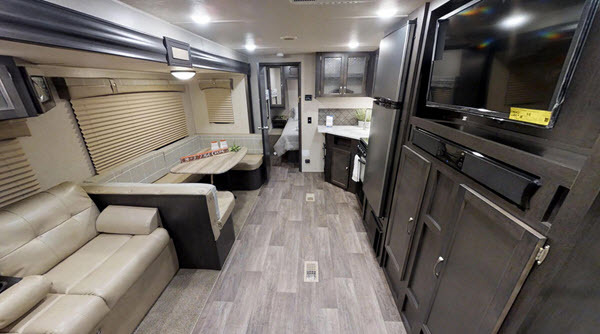 Upgradability is also taken care of with options such as a 15,000 BTU upgraded air conditioner, free standing dinette with chairs, aluminum wheels and more! Top 5 Best Travel Trailers For Couples On The Go! Top 5 Best Travel Trailers For Tailgating! When it comes to taking a all of your kids to go camping, you now know what to get if you want your first camping trip (and many more to come) to be a comfortable one. 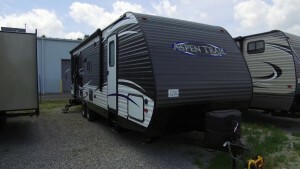 No wonder fifth wheel campers have so many satisfied users all over the world! Large families will not only need a larger sleeping capacity but also lots of storage space, features and durability to handle a large family traveling in it at once. Hopefully, this list will set you in the right direction and help you in choosing an RV that’s just perfect for you (and your family!). Share with us your travel trailer for large families in the comments below!